A kayak is a versatile boat that is used by people either explore the river or for fishing. The BKC UH-FK184 9'2" sit on top single fishing kayak is one of the latest models manufactured by Brooklyn Kayak Company, which one of the leading company in this industry. The BKC UH-FK184 1-person sit on top kayak comes with all the features that a solo traveler needs. 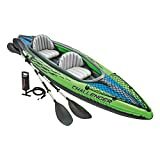 This sit on top kayak comes with huge space inside where you can keep your accessories and gears. The craft is well-suited for fishing and navigation through open water, and its dynamic features help make every outing more enjoyable and exciting. 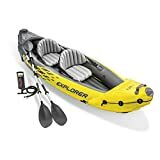 This one-person single fishing kayak comes with sit on top features, which keeps you dry while paddling and ensures stability as you stand. In the winter season, this sit on top facilities will provide you extra comfort. 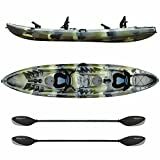 This BKC kayak has4 flush-mounts and one articulating fishing rod holders, which allows you to keep multiple fishing poles deployed at one time. So, chances for more fish! The kayak has ample spaces, i.e., two waterproof storages and a large cargo area. The waterproof place will protect your belongings like phone, Camera, wallet, etc. and large cargo area with bungee straps for bigger gear. The weight of this kayak is 58 pounds which is usually lightweight. 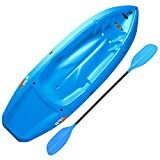 This kayak has multiple transport handles for easy overland carrying. Many men many choices, your best kayak may differ from someone else’s best kayak recommendation that because for our different purposes. There are some core features where everyone has more or less similar opinion. So before buy, you have to consider those features. Here in this review, we tried to introduce you to some of the core features that a BKC UH-FK184 9'2" sit on top single fishing kayak has. 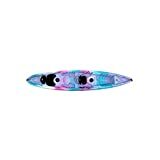 However, this single fishing kayak will be a good choice for those who like quiet fishing. You can also enjoy fishing with your friends from another kayak. The back storage place has bottle holder where you can also place cup. It is super stable that you can do fishing even without sitting or resting. So, with tons of useful features, we recommend this BKC UH-FK184 kayak will be a smart choice for the beginner to professional anglers. We do not recommend fully rely on only our opinions rather compare and apply your rational judgment and choose which suits you best.